I was simply following Garry’s advice. I showed up, queued up, paid up and wandered in. So far, so good. 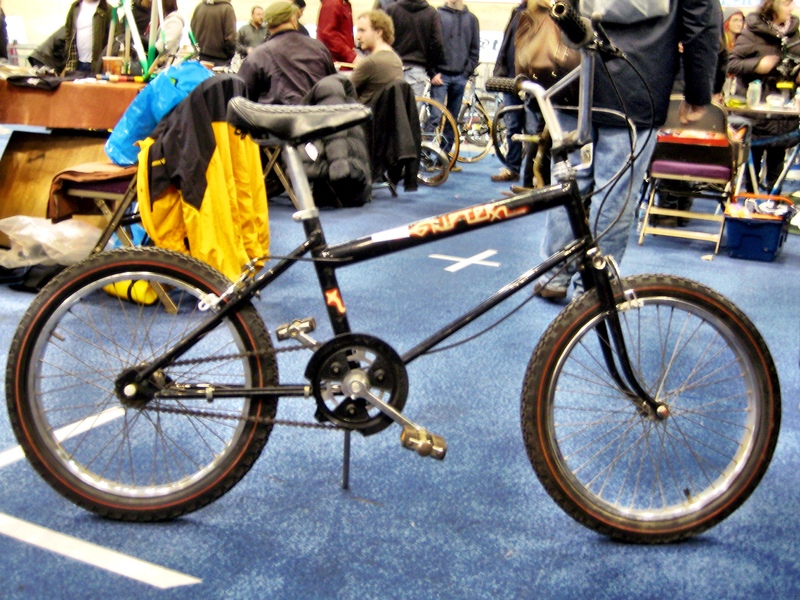 I had a list too: two tyres, inner tube, 1980s handlebar grips,old style pedals and a bolt for a mudguard. Like I say, I was following Garry’s advice. That’s where it ended. My new found impetus to make progress on my renovation projects ran aground. Garry’s advice involved being focussed but I just got carried away. Bike jumbles are easy places to get carried away in. Mistake 1: I took the kids, which was great fun but, as all parents know, shopping with a 9-year-old and a 7-year-old will test anyone’s powers of concentration. Mistake 2: Going with some friends. Again, they made it fun but if you’re in a bike jumble, and happen to know a little about bikes, your mates ask you questions. I’m a bloke and can only do one thing at a time. Mistake 3: Being far too easily distracted. OK, so I’m busily blaming my kids and my mates. Of course the truth is that it’s all down to me but if you take Aladdin to Aladdin’s cave he’s going to get sidetracked. I was dragged off in pursuit of all manner of velo trinkets and baubles. That was me – a kid in a sweet shop. So what sidetracked me? Pretty much everything. From the free cake at the stall next to the tea counter to a fully working miniature model bike it was utter submergence in everything bike. Fascination was at every turn! I managed to buy a set of bike cleaning brushes. They weren’t on my list. A load of back issues of Cyclist magazine. Not on my list. Some lights for the kids’ bikes, a really cool little book and a couple of comedy cycling caps for the kids. You guessed it, these too were absent from the now increasingly redundant list. In fact, the only thing I bought that I actually meant to buy was a pair of old style pedals for a project I’m doing as a favour for a friend. Is this a good return on time invested? Get real! To measure the success or failure of a trip to the bike jumble by the number of items ticked off a list is to rather miss the point. The real story isn’t told through what you bought or didn’t buy. It’s far more about the experience. It’s about the curiosity, the inspiration, the people and just having a laugh. The venue for the Manchester Jumble doesn’t hurt either. 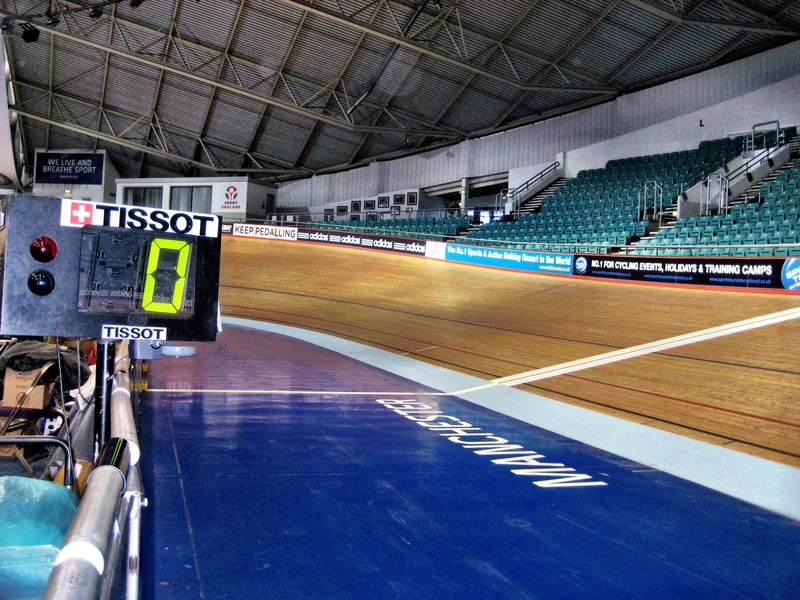 Held on the inside of the track at the National Cycling Centre velodrome, it is in one of those places that you only get to experience once in a while. A space you normally only see on the telly. We loved it. The kids loved watching junior club riders ride round the track and are now converts. 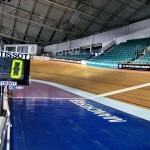 My youngest lad is now counting down the days to his 9th birthday when I’ve promised him a session on the track. Their excitement became infectious. 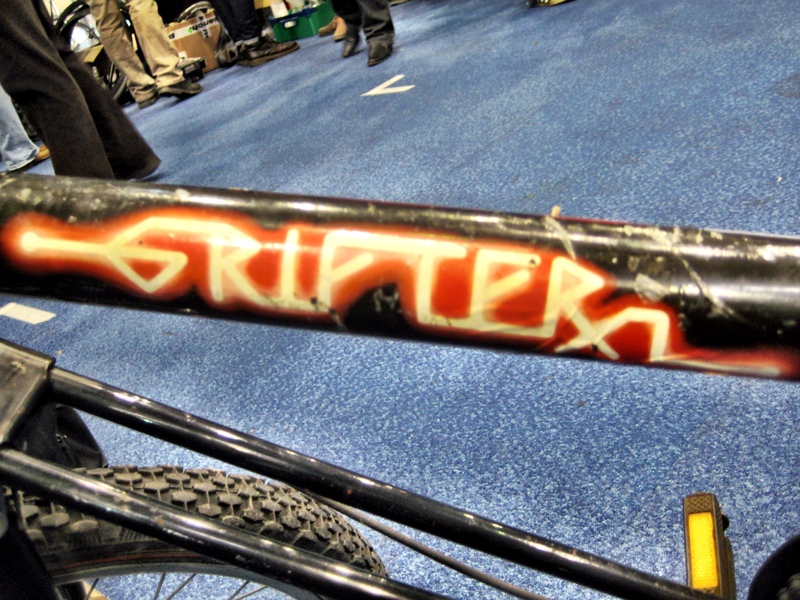 It infected me, not least of all when I saw a genuine, real-life Grifter XL. 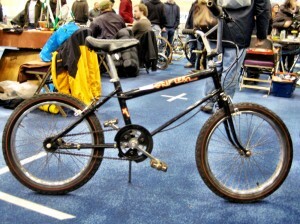 Yes I’m showing my age but anyone in their early 40s will have either had, or known someone who had, a Raleigh Grifter. I spent hours scrambling in our local woods on mine. I’m sure we all did. Dusty and sightly rusty, it had lost none of its charm. It was like 1979 all over again. I was sorely tempted but for once exercised what was left of my will power. My kids already have far better bikes, they are much lighter and have gears, they are also comparatively much cheaper than mine ever was but despite all of this I couldn’t help but think that the intervening 35 years has not been kind to childhood. Who goes scrambling these days? It’s how I learned how to truly handle a bike and these skills have since enabled me to get out of numerous tricky spots using nothing but instinct and intuition. My kids spend way too much time indoors and I think their lives are poorer as a result. They’re too often wrapped up in cotton wool, protected from busy roads and bad men. I resolved to take them to woods, get muddy and probably grazed knees. Didn’t do me any harm. Number of bikes required = n+1 (where n = the number of bikes you currently own). My friend had seen a classic French 60s child’s Peugeot town bike that would be perfect for her little girl. Vintage things are all the rage these days and what could be cooler for a West Didsbury 10-year-old than their very own vintage steed? A quick mechanical check and well natured haggle later she paid £50 for it. Friend number two then followed suit after spying a vintage Coventry Eagle she wanted as a hack around town. Similar mechanical checks and haggling followed with the same result. The bikes are both brilliant and great value. They are fully working pieces of vintage cycling style with two very proud new owners. How many other things – that are worth keeping – can you get for £50? We left having experienced bike heaven. They had their bikes while I had a bag of curiosities I hadn’t planned to get and a redundant shopping list. As I left I couldn’t help but think that Garry would be disappointed in me.